If you are planning to take course evaluation survey for this semester you might find the following post of some interest to you. An anonymous survey with close-ended and open-ended questions about the course and course instructor administered at the end of the semester is common practice in higher educational institutions. Despite the wide use of such surveys to improve the quality of education offered by universities, course evaluation and instructor evaluation’s reliability is questioned with regards to several aspects. Students’ evaluations are biased and subjective. Students rate the instructors higher when they expect that their grades will be high (Tech, 2010). Similarly, the more effort they put into learning during the course the higher they rate the instructor. Students’ evaluation is dependent on their personalities, especially on their agreeableness and neuroticism (Mccann & Gardner, 2014). Less agreeable students and more neurotic students tend to rate their instructors more negatively. Moreover, gender also influences the evaluation of instructor. Female students assess their instructors more positively than male students (Feldman; as cited in Brozik, 2012). Likewise, there seems to be a gender bias against female instructors. Compared to male instructors, female instructors are rated lower (Rutland; as cited in Brozik, 2012). Class size and response rate should be also taken into account. According to Kuwaiti, Quraan and Subbarayalu (2016), the data collected from small classes with low response rate is not sufficient to be reliable and cannot be generalized. The scholars suggest considering adequate only the data with minimum medium response rate for small classes. Another interesting finding about small size classes is reported by McKeachie (as cited in Brozik, 2012). It appears that students from small classes rate their instructors more positively than those from large classes. Finally, the dimensions of course evaluation and instructor evaluation often overlap and are confused by the students. Course content influences the rating of the instructor and vice versa. If the content is interesting the instructors tend to be rated in a more positive manner (Brozik, 2012). Similarly, the findings form the study by Landrum & Dillinger (2004) show that the results for course evaluation are positively correlated with the results for instructor evaluation. I personally, felt the influence of instructor evaluation on the course evaluation. When I liked the instruction I always found the course useful and vice versa. 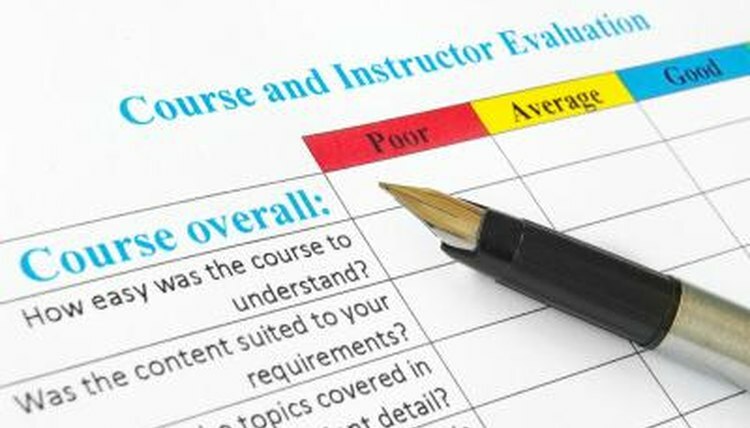 What do you think about course evaluations and instructor evaluations? How effective do you think they are? Brozik, D. (2012). The Other Side of Teaching Assessment, US-China Education Review, 1, 107–112. Landrum, R.E. & Dillinger, R.J. (2004). The relationship between student performance and instructor evaluations revisited. Journal of Classroom Interaction, 39(2), 5–9. Tech, V. (2010). Course grades , quality of student engagement, and students’ evaluation of Instructor, International Journal of Teaching and Learning in Higher Education, 22(3), 331–336. Thank you for your useful and interesting post! I find it really helpful, especially now when I am going to fulfill some remaining course evaluations. I see how important it is not to mix course evaluation and instructor evaluation. Of course, there are some biases in students’ evaluation, but it helps to improve education process for the better. When I do course evaluation I think about MA1 students and believe that my feedback will help to make their learning more effective and productive. sashaxxxx, great post! And most importantly, very timely post. It is a tough question whether I evaluate the instructor of the course or the course itself. I mean, if students see that instructor is interested in what he/she is teaching and puts effort to make the course materials engaging – they get engaged. If students are not satisfied with the instruction there is no way they will find the course helpful. Well, what can we do with that? What I find especially interesting is the correlation between the class size and the response rate. I would be cautious when interpreting these results because the problem here is in someone’s opinion dominating over other students’ ones. If someone very respected in the group expresses his/her own opinion it might affect others’ thoughts about the course and instructor even if they believe it doesn’t. So… Oh, Sasha, I am so confused in my own thoughts and I think it’s because you have given me so much food for thought at once. I’ll just check twice what I’ll be writing in my course evaluations so that it is not affected by the expected mark, or instructor, or gender, or whatever it can be. Thank you!